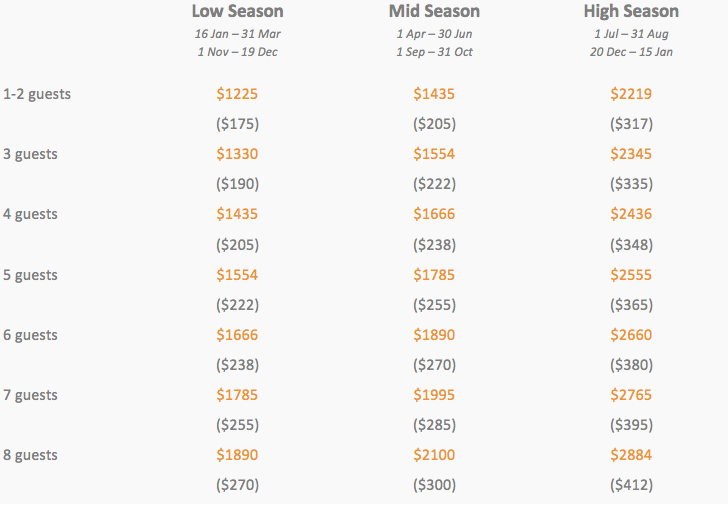 ﻿All prices shown in Australian Dollars per week (per night cost in brackets)*. Minimum rental period 3 nights. Enquire about our special "last minute booking" discount rates! A discount of $75 off the standard rates is offered on all bookings of 14 days or longer. Long term rentals available upon request at reduced rates. Please contact us for details. A $200 security deposit is required for all bookings. The rental rates are for the exclusive use of the villa and include gas, water and electricity consumption, all linen (towels & sheets), government taxes (including 10% rental tax), staff costs, help desk, free Wi-Fi Internet, full use of all facilities and a welcome package including the first dinner and breakfast after arrival as well as fresh fruit, bread and assorted beverages. We can arrange for a﻿ driver ﻿to pick you up from the airport (or any other location in Bali) for your transfer to Villa Sianti. A vehicle for 4 people plus luggage will cost Rp 650,000 (approx $AUD65). A larger vehicle can be arranged for larger groups at an additional cost. This is not included in the villa rental and the payment should be made directly to the driver. Whilst it is only 90 kilometres from the airport to the villa, transit time is between 3 and 3.5 hours (depending on traffic). However it is a pleasant, scenic drive taking you through the very heart of Bali and we recommend the occasional stop to stretch your legs or pick up some refreshments from one of the many convenience stores along the way. Villa Sianti has drivers available on call. The hillside location of the villa means it is not within walking distance of most facilities so going to the beach or out to dinner will require vehicle transport. Drivers for short journeys or for ½ day or full day sightseeing trips can be arranged via the help desk. Further details about driver costs are available in the Information Booklet. Our friendly staff can look after the groceries for you. If you advise them of your requirements one day in advance, the following morning they will go to the markets to purchase fresh fruits, vegetables, meat & fish for your meals. They will provide your change along with all receipts (bearing in mind, receipts may not be possible at market stalls). To provide this service, they charge a minimal fee to cover petrol/transportation costs of approximately Rp.20,000 (AUD$2). However, if you prefer, a driver can be arranged to take you to the new Pepito supermarket or into Seririt or Singaraja to do your own shopping at one of the larger supermarkets. All visitors to Bali must register with the tourist police. All guests are requested to bring 2 copies of their passport and they will be required to pay a small fee of Rp 30,000 (AUD$3) per person. In the days following your arrival either a representative from the help desk or your housekeeper will collect the passport photocopies and fees and look after the registration for you with the tourist police.